Before we begin…..let’s have a quick history lesson. The Brewery District has seen the best of the boom times and could have been classified as a ghost town in other eras. Long ago, before prohibition, it really was a Brewery District supporting over 600 bars and Taverns in Columbus and more elsewhere and business was very good. 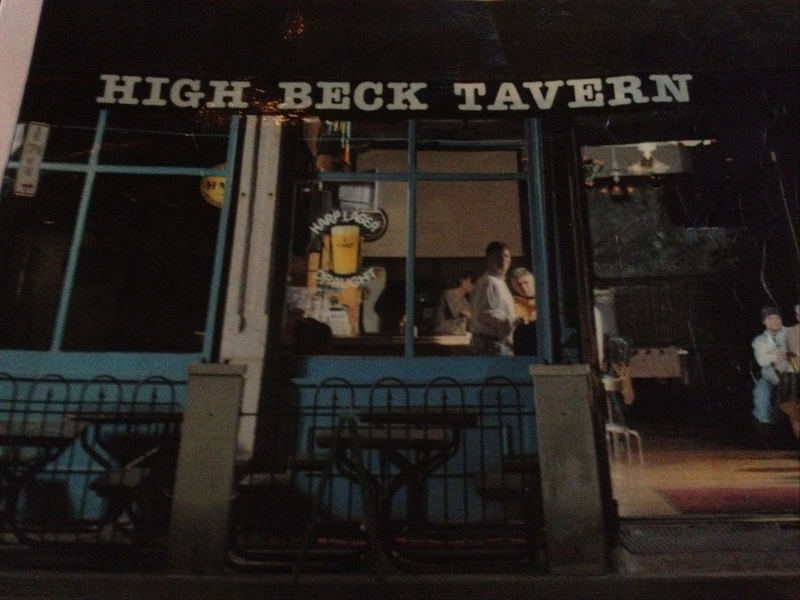 The High Beck opened in 1921, after Prohibition started, during the “meh” era of South High Street. In the early 1990’s to early 2000-aughts, it was the boom times and the Brewery District was THE place to be. Parking was scarce, Victory’s was the premiere meat/meet market to be for the gold chained, polo shirt wearing, pegged jeans and big hair crowd while the pre-dawn of hipsters were hanging out at Hoster’s and the Columbus microbrew world was experiencing the first renaissance that did not persist. At the epicenter of this, at least for many I knew, was the High Beck. (We called it the Hi Beck, as per the sign on the south side of the building). Often crowded beyond comfort, this joint, was the place to go for great local music and good beer. While I saw a few good bands here in the 1990’s, I never really hung out there otherwise and promptly forgot about the place. But then, the area fell out of favor again and many businesses went bust and the district faltered. The area is taking off again, but during the limbo era in between, the High Beck Corner Tavern survived the lean times while Victory’s, BW-3, The Clarmont and others bit it. Why High Beck? The tavern is at the corner of South High Street and Beck Street, hence the name. Why has the High Beck survived? Regulars can answer that question better than me – and they are much of the answer I am sure, so if the High Beck is, your spot, please post here to enlighten me. The joint still features live music but not as much as in days gone by. As far as how the tavern came back on my radar the answer is easy….pizza. During of the Pizza Gran Prix events I used to do, some wonderful person brought in a SmokeHouse Combo Pizza from the High Beck. The Smokehouse features both the house made Texas BBQ brisket and hickory smoked pulled pork on top, house made BBQ sauce at the base with some mozzarella mixed in so it can be called a pizza and not a sandwich. This was easily one of my favorite speciality pizzas and more importantly, it ages well for next day consumption. However, I always had the pizza to go and never experienced it in house. It has taken me years to get back to the High Beck and the pizza got me through the doors. However, this delay on my part still lacks any rational reason. On Mondays, the tavern offers FREE pizza from 4 pm and after. On Tuesdays….FREE coneys….and yet, contrary to all things that define me….I never made it there for free food. The BBQ itself is worthy of mention. The house made sauce can be found in squirt bottles on the tables. 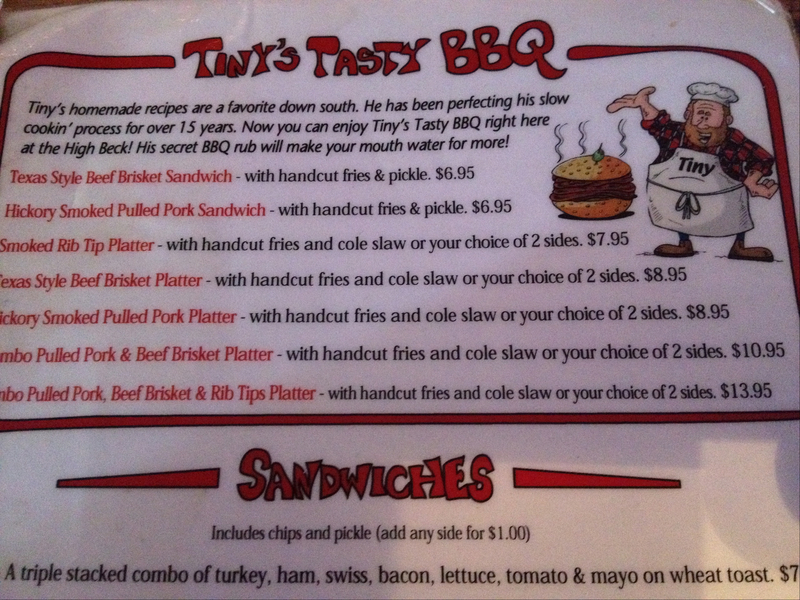 The menu tells us that the house BBQ is created by Tiny. Tiny’s BBQ was perfected over 15 years in the south now to find itself in the land that spawned the war of Northern Aggression piled on top of an Italian Pizza Pie. This may seem like an odd twist of fate yet I have no complaints. I know many people (mostly of the female persuasion), that hate BBQ pizza as an abomination to the purity of the pizza concept. I do not. There are many foods I would add BBQ to if social constructs were more forgiving, but I usually know how far to push things. Well, sometimes I do, maybe not for food. Tiny, keep making BBQ and find more stuff to pile it onto. 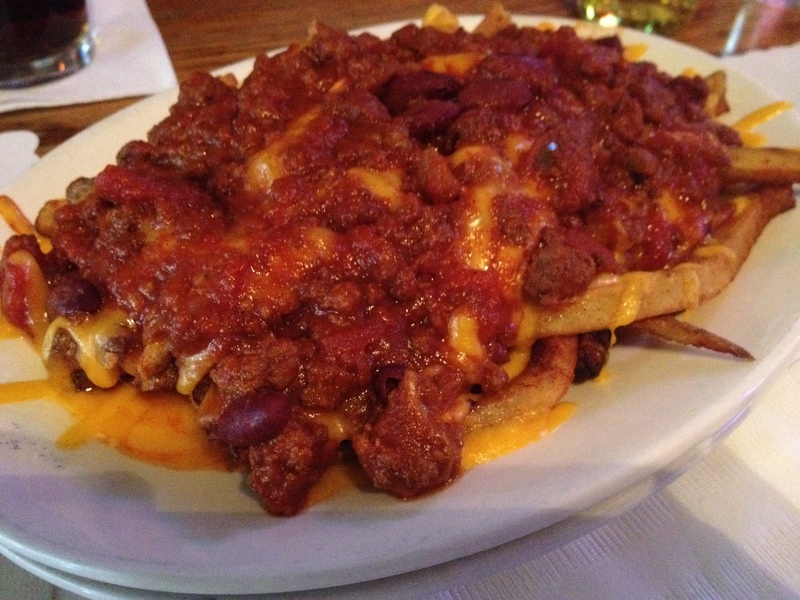 But if BBQ is not your thing, the High Beck has some belly busting chili cheese fries that will balance out two or three beers with no effort at all. Or, maybe you would like to try out their make your own bloody Mary Bar? Finally maybe food means nothing to you (so why are you reading this?) if that is the case you will find a good selection of beers, ping-pong, foosball, darts and a pool table to pass the time and wonder why you keep thinking about getting a BBQ sandwich. This entry was posted on February 21, 2013 at 3:33 PM	and is filed under bar, BBQ, beer, restaurants. 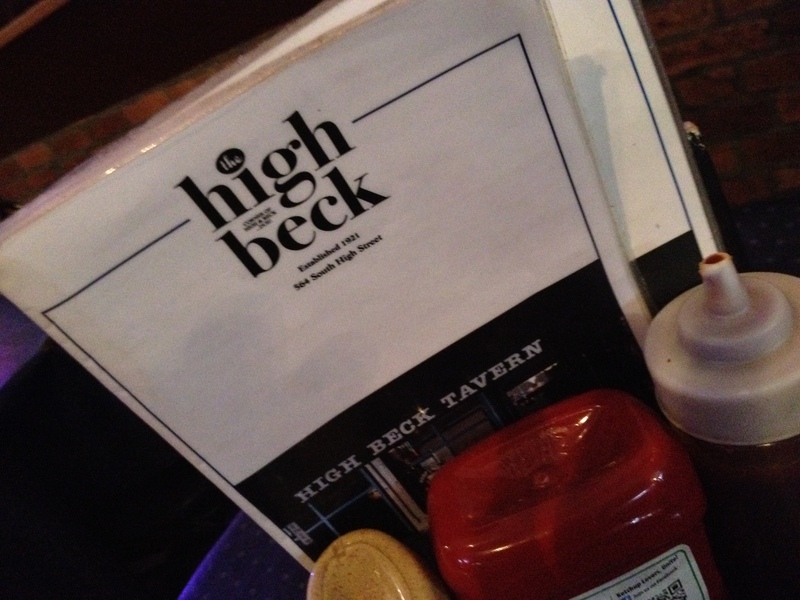 Tagged: Hi Beck, High Beck, High Beck Corner Tavern. You can follow any responses to this entry through the RSS 2.0 feed. You can leave a response, or trackback from your own site.